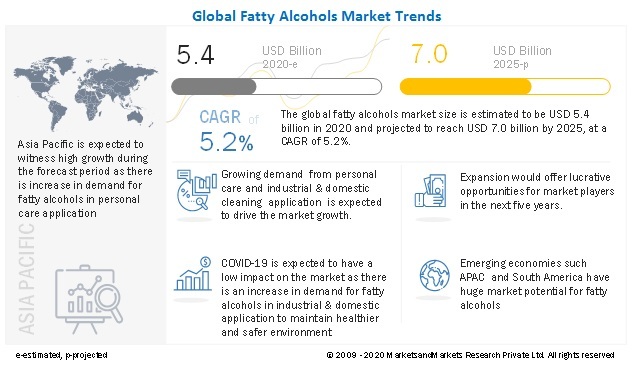 [140 Pages Report] Fatty Alcohols Market is estimated at USD 4.72 Billion in 2017 and is projected to reach USD 6.01 Billion by 2022, at a CAGR of 5.0% between 2017 and 2022. In this study, 2016 has been considered the base year and 2022 the forecast year to estimate the market size of fatty alcohols. Different secondary sources, such as company websites, encyclopedia, directories, and databases such as Hoovers, Bloomberg, Businessweek, Factiva, and OneSource have been used to identify and collect information useful for this extensive, commercial study of the global fatty alcohols market. Primary sources, including experts from related industries, have been interviewed to verify and collect critical information and assess prospects of the market. The top-down approach has been implemented to validate the market size in terms of value. With the data triangulation procedure and validation of data through primaries, the exact values of the overall parent market size and individual market sizes have been determined and confirmed in this study. The fatty alcohols market has a diversified and established ecosystem of upstream players, such as raw material suppliers, and downstream stakeholders, such as manufacturers, vendors, end users, and government organizations. This study answers several questions for stakeholders, primarily, which market segments they should focus upon during the next two to five years to prioritize their efforts and investments. These stakeholders include fatty alcohols manufacturers such as Wilmar International Ltd (Singapore), Kuala Lumpur Kepong Berhad (Malaysia), Musim Mas Holdings (Singapore), Godrej Industries Limited (India), Procter & Gamble (US), VVF Ltd (India), Sasol (South Africa), Kao Corporation (Japan), Emery Oleochemicals (Malaysia), and Royal Dutch Shell Plc. (Netherlands). This research report categorizes the global fatty alcohols market based on type, application, and region, and forecasts revenue growth and provides an analysis of trends in each of the submarkets. Each type is further described in detail in the report with value and volume forecasts until 2022. Each application segment is further described in detail in the report, with value forecasts until 2022. Each region is further segmented by key countries, such as the US, Mexico, Canada, China, Indonesia, Japan, Malaysia, India, Germany, Benelux, the UK, Italy, France, Turkey, Russia, Saudi Arabia, the UAE, Argentina, and Brazil. 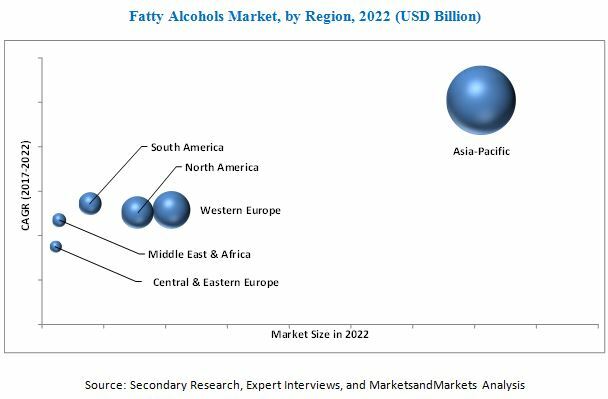 The global fatty alcohols market is projected to reach USD 6.01 Billion by 2022, at a CAGR of 5.0% between 2017 and 2022. By volume, it is expected to reach 4.56 Million tons by 2022. The growing use of fatty alcohols in surfactant-based industries such as personal care & cosmetics, soaps & detergents, textiles, oil & gas, etc., as well as the flexibility in feedstock availability and extensive consumption of fatty alcohols in emerging clusters of Asia Pacific are some of the key factors driving the global fatty alcohols market. Based on type, the pure & midcut fatty alcohols was the largest segment of the global market, by type in 2016. Pure & midcut fatty alcohols are used extensively in the synthesis of surfactants. Surfactants are used in manufacturing laundry detergents, dishwashing detergents, liquid soaps, and other household cleaning products. These are also used as lubricant additives in aluminum processing and metalworking applications. Such wide-scale applicability of pure & midcut fatty alcohols drives their market across the globe. Based on application, industrial & domestic cleaning was the largest application segment of the market in 2016. Fatty alcohols and their derivatives such as fatty alcohols ethoxylates and sulfates are used to manufacture soaps and detergents for industrial and household cleaning purposes. The increasing concerns for sanitation and hygiene to promote public health and increasing per capita expenditure on household cleaning agents is expected to drive the market for fatty alcohols in industrial & domestic cleaning application globally. The Asia Pacific region led the global fatty alcohols market, in 2016. The growing demand for fatty alcohol-based surfactants in industrial cleaning, cosmetic & beauty products, household laundry, food processing, polymer & plastics, and lubricants is driving the market of fatty alcohols in the region. Asia Pacific is expected to cater the most flourishing end-use industries worldwide with China, India, and Japan being the major forefront players contributing significantly to the region’s economy. Mounting population, growing disposable income of people as well as their tendencies to adopt a modern lifestyle to be at par with the Western culture is giving a boost to the growth of the aforementioned industries. This largely drives the demand for commodity chemicals such as fatty alcohols in the region. The global fatty alcohols market is witnessing moderate growth. Factors restraining and challenging the growth of the fatty alcohols market are the surplus production leading to oversupply and instability in raw material prices. Wilmar International Ltd (Singapore), Kuala Lumpur Kepong Berhad (Malaysia), Musim Mas Holdings (Singapore), Godrej Industries Limited (India), Procter & Gamble (US), VVF Ltd (India), and Sasol (South Africa) lead the global fatty alcohols market. These players are gaining a strong foothold in the market through their strategies of expansion of manufacturing facilities and mergers & acquisitions. 10.11.10 KH Neochem Co., Ltd.
10.11.13 New Japan Chemical Co., Ltd.
10.11.14 Zhejiang Jiahua Energy Chemical Industry Co., Ltd.